As school moves into full swing, there are all of the logistics to figure out: carpool rotations, scheduling playdates, organizing classroom volunteers for projects or letting friends and family know about upcoming school and after school events. Amongst the madness, there are some great apps and services that help to make these aspects of your life a wee bit more manageable. Here are some of our favorites to help organize and ease your back to school life. Who’s free to go to the park or meet at the museum on Saturday? 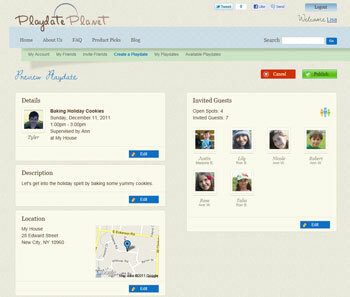 Playdate Planet lets create a playdate with details about the activity, select the number of available spots on the playdate and notify friends when and where your child is available to play. Confirmations are then accepted on a first-come, first-served basis. If you have kids in school, you’re nearly guaranteed to be asked by your child’s teacher to volunteer in some aspect of the classroom, or, if you’re a coach in your child’s afterschool sport, you may be asking for parent volunteers yourself. VolunteerSpot recently released an app , Clipboard (free in iTunes) to simplify the paper signup sheets and flurry of reply all emails in your inbox by using one app to centralize it all. 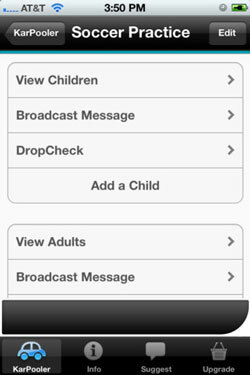 If you don’t have an iOS device, you can access everything on VolunteerSpot.com. Have you ever skimmed your Facebook feed to discover that a friend was at the same event you were, but you never ran into her? Or that a family attended the same festival as yours, and had you known, you could have enjoyed it together? While Facebook, Foursquare and GetGlue help people to share what they’re doing and thinking in the present or past – UpTo (free in iTunes) helps you to privately share your upcoming events and activities with friends and family. UpTo adds value to the sharing aspect by allowing you to potentially meet up or coordinate better with your friends, neighbors, colleagues and family. Coordinating carpools can no doubt be stressful, but KarPooler (free in iTunes) cleverly provides the means to schedule carpools through the app, view kids that are part of the carpool, broadcast a message to the entire group (in the event that you’re stuck in traffic or stuck at the office and will miss pick up), or send a note to a parent once you’ve dropped off their child via the “DropCheck” function. KarPooler is free on iOS devices, but you can upgrade for $0.99 to create unlimited carpool groups. 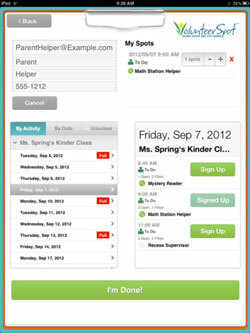 https://carpool-kids.com has a great iPhone App to manage carpools for your kids. 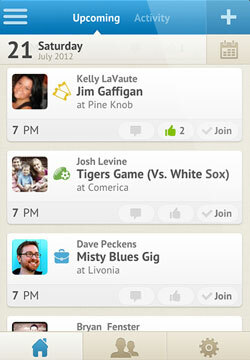 It also has a web app for carpool members not on iOS. My friends and I have had a lot of fun using the app over the past few months.